Eek, I’m freaking out a little! Can you believe we have been doing our creative preschool themes for 2 yrs already?! Next year all 6 preschoolers will be in kindergarten. So today I am sharing our last collaborative preschool theme and it’s a fun one – counting to 100. 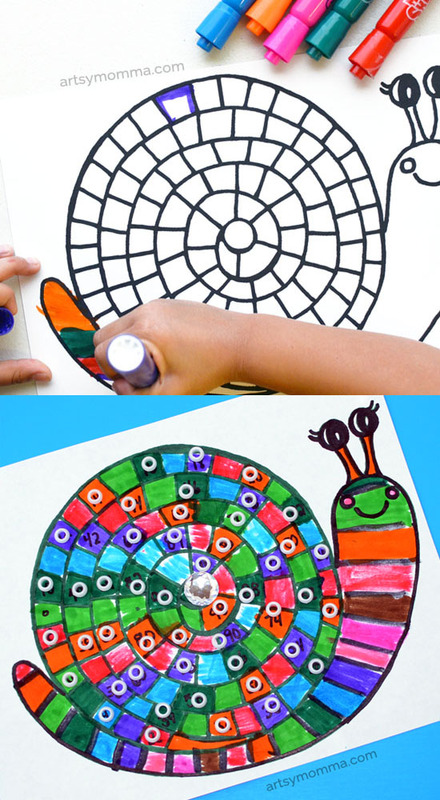 For our activity, we made a count to 100 printable snail activity that you can also use as a coloring page. Check out how the rest of the crew tackled this prompt linked towards the end of this post. This can be used several different ways. Kids can color it or leave it blank, add numbers 1-100, or add numbers for counting to 100 by twos, fives and tens. 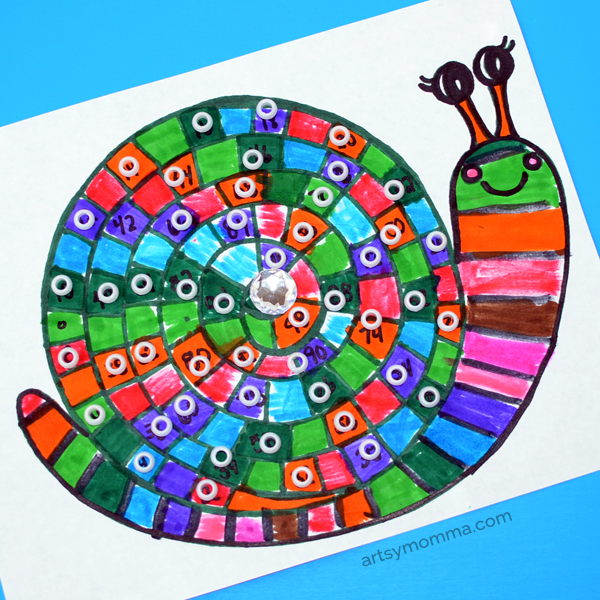 Little Sister colored her snail with purple squares for counting by fives and tens. They also act as a place marker since it is easy for even adults to lose track while counting. Big Brother colored a sheet for her and I added all the even numbers so she could learn to count by two, an area we haven’t worked on yet. 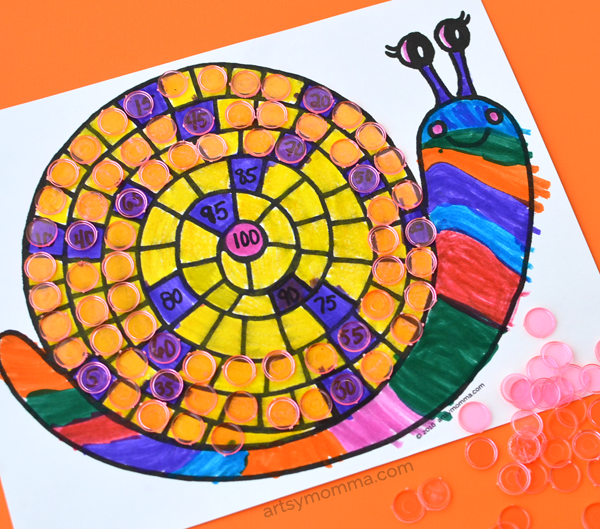 Some ideas to use as counters are: bingo chips (like our pink ones in the counting by ones photo), buttons, tiny gems, beads or anything else small enough to fit the squares. By downloading/printing this activity you are agreeing to use it for personal or classroom use only. You may not host the file elsewhere or modify it’s contents. When linking to the printable, please do not link to the pdf as these links change occasionally. Instead, please link to this post. Thank you! If you use this printable, we would love for you to tag us on Instagram @artsymomma_amanda! 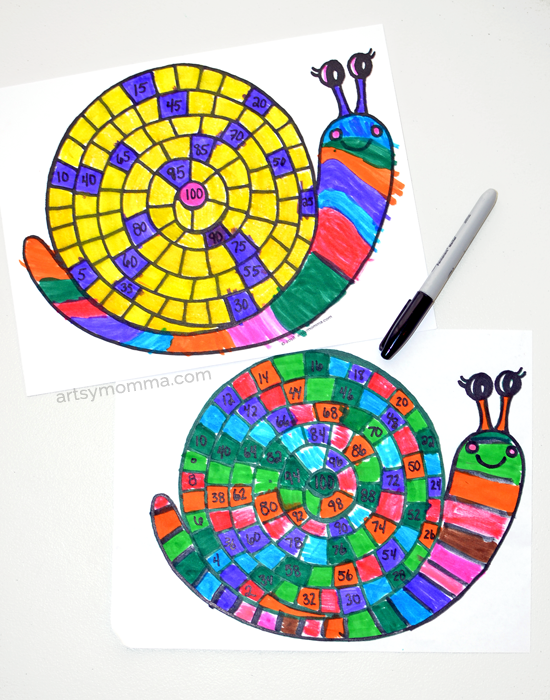 If you enjoyed our count to 100 printable snail activity, you might enjoy our paper plate alphabet snail!